The VARRAM smart robot makes sure your pets are active, healthy and never alone. Getting an animal pet could be one of the best decisions you make. However, this decision comes at a cost. You have to pay attention to the well-being and fitness of your pet if you are to enjoy the companionship. Currently, about 60% of pet dogs and cats are clinically overweight. Obese pets have a shorter life expectancy as they are prone to various disease conditions. However, time and other constraints prevent many a pet owner from ensuring that their pets get enough physical activity. Asides, obesity, lethargy, and depression could also set in for pets that stay at home alone for a long time. The VARRAM fitness robot spectacularly solves the problem of boredom and a lack of physical activity for pets. You no longer have to worry about having an overweight or depressed dog or cat. Simply buy them a second best friend and you can rest assured they are fully engaged until you come back home. The robot is optimally designed to engage all the five senses of your pet while keeping them mobile and active. The robot plays with your pet, zooming around the home automatically and inviting your pet to move about. The intelligent sensors ensure the robot can move about your home without bumping into obstacles. It is also capable of detecting your pet’s location, inviting them to play at pre-set times. At full charge, the Li-ion battery can keep your pet engaged for 10 hours- dispensing treats, keeping them mobile and treating them to a fun time all the way. The VARRAM fitness robot can be remotely controlled via the smartphone app. Perhaps you’ll be staying outside for longer than you planned, you can activate the robot to play with your pet via the app. The app also controls other robot functions such as how many treats your pet can have, how long your pet needs to play, etc. 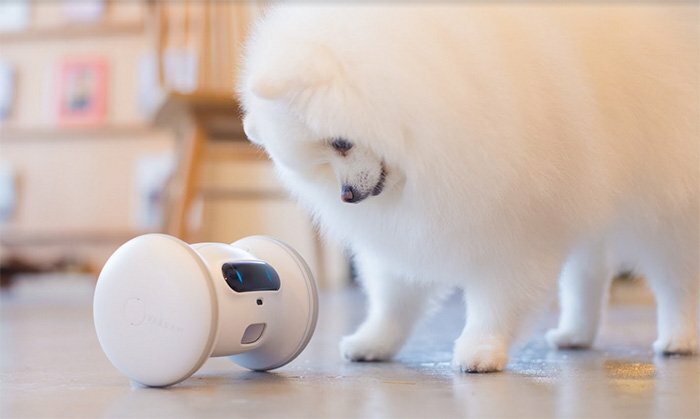 The robot is further equipped with AI technology, making it capable of detecting your pet’s mood and adapting to the personalities of different pets. The VARRAM fitness robot is carefully constructed with ultra-durable materials that can withstand physical impacts. The makers say that it can withstand the strongest bite from the strongest dog (English Mastiff) and it still stays strong when it bumps into obstacles or falls down the stairs. The manufacturers understand that your dogs would be inquisitive enough to wonder what’s it about this device that keeps following them about. So, the VARRAM fitness robot was constructed to withstand a heavy bite or beating. VARRAM fitness robot is currently at the crowdfunding stage. Its Indiegogo campaign is already more than 500% funded. However, you can visit the campaign page to know the available pledges and the corresponding rewards. The first batch of shipping is expected to commence by January 2019.